Direct mail postcard promotion results in a response rate of over 20% ! The FloorPass system was virtually unknown. a. carry the piece from home to the show. b. remember to bring the piece to the booth to receive a free gift. Develop a strategically targeted direct marketing campaign that would intrigue the appropriate audience and persuade it to respond. Establish a unique selling proposition (USP) to position FloorPass as the only system to offer traders its combination of services. Create a well-defined and memorable theme to set FloorPass apart from its competitors. Employ credible, commanding copy and enticing graphics that meet proven direct marketing standards. Include a valuable offer for maximum results. A three-part campaign was developed to reach and motivate the optimal audience. The theme based its strength on the credibility of professional trader Bruce Reale and the respect garnered from his success in the markets. First, an oversized postcard (11 x 6) was designed to target both preregistered and past investment show attendees. The postcard teased a FREE special report from Reale titled The #1 New Trend in Online Trading Today. Valued at $39.95, the report promised to reveal nine secrets of E-mini futures trading. 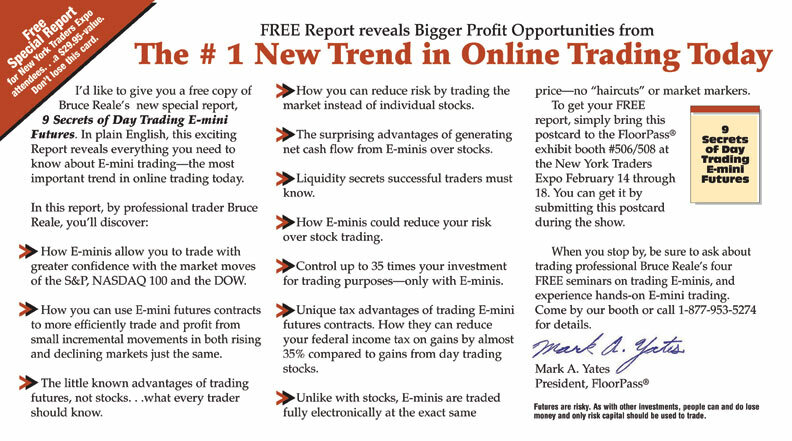 The mailer also promoted the opportunity to “experience hands-on E-mini trading” at the FloorPass booth. The second part of the campaign was a flyer distributed at the investment show. It featured a certificate-style border in eye-catching red to draw attention to the “FREE report” offer and invitation to visit the FloorPass booth. The remaining space was used to promote the top 10 benefits of the FloorPass system. Following the show, a letter was sent to the names captured at the investment show booth to remind attendees of the many unique advantages of the system. While most direct marketing promotions are considered successful if they generate a 1%–3% response rate, this particular campaign resulted in a postcard redemption rate of more than 20%! Far surpassing expectations, this provided Velocity Trade with a highly targeted database of potential customers for its FloorPass system.